How many shares did the quiz get? How many people viewed the quiz? How many sites linked to it? The answers are almost 8,000 shares, 5,500 views, and zero links. Yes, more people shared this quiz than viewed it and not a single person linked to it. My next question is: Does the quiz drive traffic, build authority, and help conversions? It seems unlikely. By contrast, an article on content shock by Mark Schaefer received far fewer shares than the quiz (4,700), but gained links from over 900 domains. His post continues to attract new links and drive traffic every week. These may be extreme examples, but it is increasingly clear that while shares are important, they are not enough to ensure content success. Social sharing is one part of the amplification process and content shares in themselves are not a measure of success. By contrast, content that gains both shares and links is much more likely to build authority and drive traffic. In this post I take a look at the issues, including the importance of an amplification strategy and content that achieves both links and shares. Content marketing is hard work. A recent survey found that brand marketers increased their publishing by 800% over the last five years but engagement per post declined by 89% over the same period. In our own 2016 survey, we found that 50% of content published by the 95 top B2B sites received 106 shares or fewer. When we looked at another 100 B2B sites we found that 50% of the content received 22 shares or less. The difficulty of generating social engagement is compounded by content growth and increasing volume of content competing for attention. Below is the growth in monthly blog posts published on WordPress over the last 10 years. Over 70 million blog posts are published each month on WordPress alone. Publishing content and expecting people to find it simply doesn’t work anymore, if it ever did. As Rand Fishkin says, there’s no prize for hitting publish. Even publishing great, high-quality content is not enough. One of the most common reasons for content failure is the lack of amplification. Content creators need to think about how and why their content will be amplified before they create it. Why will people share it? Why will they link to it? How will they find it? Social networks have become important content discovery platforms. Think about the articles you looked at today, how many did you find via a search engine and how many from a social network? Most links shared on social are never clicked. Social posts tend to have a limited shelf life. If you missed a tweet this morning, will you ever see it? Social sharing usually declines quickly in the days and weeks after content is published. Even shares by influencers do not necessarily move the needle when it comes to generating traffic. Not all influencers are created equal. It is not uncommon for influencers to have 500,000 Twitter followers and an average retweet rate of just 15 or 20 followers. Thus, the tweet is only retweeted say 20 times, and the number of click-throughs could be even less. An influencer’s number of followers is fairly meaningless. The best influencers for content amplification are those with good follower engagement and high retweet rates. You are much better off in a niche with an influencer who has a highly engaged but smaller audience than someone with hundreds of thousands of followers who rarely engage. Some people assume that if they promote an article on social and it gets a high number of shares it also gets a high number of links. To be fair, I assumed some sort of correlation too. During our content research in 2015, I was initially surprised to find no correlation between shares and links. However, the more we investigated, the more it became clear that people share and link for different reasons. The overlap between sharing and linking relates to helpful and valuable content. Some content forms – quizzes, listicles, infographics, etc. – are well-suited to sharing but attract few links. But creating content that attracts shares does not necessarily gain you links and you need links. Backlinks remain the most powerful form of amplification. They are hard to earn, but they stay around much longer than a tweet and are a powerful Google ranking factor. I have set out some examples below. Some of the best content marketing simply answers a customer’s question. These two examples of simple but authoritative content answer what-is questions. In my research, good answer posts do consistently well when it comes to links but are often overlooked by content marketers. This is particularly true of basic questions. What may seem too basic to you can be helpful to new people joining the industry. Answering the questions your customers are asking remains one of the most powerful forms of content marketing. Does Your Content Answer Searchers’ Questions? Strong opinions and controversial opinions drive not only shares but also high numbers of links. People share opinion posts to be part of a tribe – to show they belong and to support causes or views they care about. These posts also gain links as people want to reference articles in support of their view, as a jumping-off point for discussion, or to take issue with the post. This example of a political viewpoint by Michael Moore and an opinion post on content marketing by Mark Schaefer achieved a high number of links compared to other posts on their respective sites. Michael’s posts typically get a lot of shares (as you would expect) but generally earn less than 100 domain links and sometimes less than 10. In fact, his site has a total of 3,900 domain links and over 1,000 of those links are to this single post. In Mark’s case, this one strong opinion article accounts for over half of all the domain links to his blog. Our studies show that original research gains both shares and links. The Pew Research Center consistently achieves high levels of shares and links from its published research. Social Media Examiner has a large audience and gets consistently high shares for its content. However, SME’s posts rarely gain more than 100 domain links. The one big exception is its annual state of the industry report, which is based on original research. It has become reference content. The 2016 report earned over 500 links. We find that a targeted email to our audience can drive far more traffic than social sharing. If you have subscribers – or a segment of subscribers – interested in a particular topic as shown by previous email opens or visits to specific blog posts, a targeted email to promote your post can be effective. Having an influencer share a link is helpful but far removed from the impact of influencer advocacy. Advocates will mention you while speaking at an event or in a podcast. They will also name you in a blog post on their own site or in a guest post for a major media outlet, and they may include your link. Influencer mentions may fail to create a blip in your traffic stats. Thus, your influencer marketing should be about building advocates, not seeking influencer mentions and shares. SEO and visibility in search engines is a long-term game, but you need to address how to improve your content’s visibility – from the content to its technical factors. Active link-building is one of the best ways to improve your content’s search-engine visibility. The sharing of your content by other sites indicates to search algorithms that your content is valued by others. Increasingly we live in a pay-to-play world. Organic reach is harder in search or social. You should consider promoting your content through Google ads or boosts of Facebook posts. Paid promotion is an important part of your amplification strategy. Social sharing is not a content amplification strategy. Even high shares and mentions by influencers do not mean your content will gain links, build authority, or drive traffic. Content amplification is as important as content creation, possibly more so. Thus, for every piece of content you need an amplification strategy. That viral quiz or listicle may gain shares and that may be enough to generate some awareness but will it have longevity? More importantly will it build your authority, increase your traffic, and help convert visitors to customers? Your aim should be to create content that attracts both shares and links. The Content Marketing Institute amplifies its content every day through its free daily newsletter. Subscribe today. Steve Rayson is one of the directors and owners of BuzzSumo. He undertakes regular research on why and how content resonates with audiences. 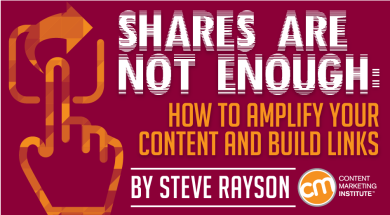 Steve is particularly interested in how content gets amplified through shares and links. Follow him on Twitter @SteveRayson.